Am I correct to presume that the connection orientation is the same for both modules - i.e. 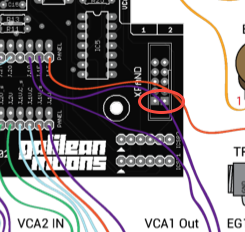 if both modules are vertical, the top left pin of Jupiter would connect with the top left on Galilean (similar to the power orientation for Eurorack, where the red stripe designates the -12V at the bottom of most connectors) ? It's quite clearly labeled on the PCB on mine. Red goes to bottom. one thing to point out though, is that the DiY version is not compatible with the factory built module. That is you cant use a Diy Jupiter Storm with a factory built Galilean moons. In the absence of a schematic I figured some good people here could confirm the orientation of the connectors. 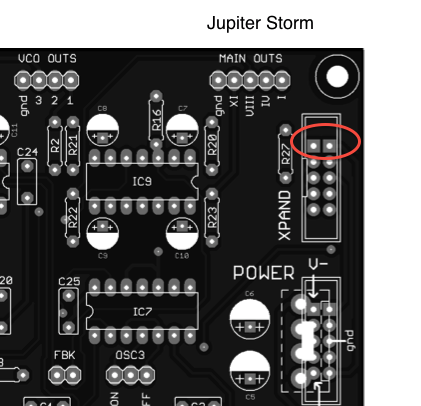 i will have to confirm with my modules later tonight (both are DIY), but looking at the pictures of the PCBs in the build manuals, on the Jupiter Storm, Pins 1-2 are the top two terminals (square solder pads) and Pins 1-2 on the Galilean Moons are down (again, going by the square solder pads and the connector silk screen on the PCB in the manual). Thanks - I just spotted the keyed header screen myself - and the fact that they are oriented differently on each board.